The brush of soft flannel against your cheek reminds you of cuddling on Grandpa’s lap. The feel of a special old blanket or robe or the look of that cool old jacket takes you back to a time when you used and enjoyed those things. Do you remember Grandma’s wild swim suit cover-up and how everyone howled when she put it on? Imagine capturing those precious memories for generations to enjoy. It is possible to save those memories with Memory Bears made from garments from past days or something saved from a loved one who has gone on ahead of us. Different items hold sentimental value for people. For some it’s a shirt or pants, for others it’s a tattered baby blanket. 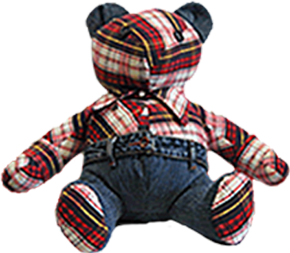 Any fabric that is connected to your memories is well suited for a Memory bear. At Pins and Needles Alterations, Sarah and Judy have made bears out of everything from football jerseys, to baby sleepers, to letterman jackets. One special group was made from the military uniforms of a beloved uncle who didn’t make it home. They were completed the day before Christmas. Every bear that leaves the arms of Pins and Needles Alterations gets a hug and some of them even get a tear or two. 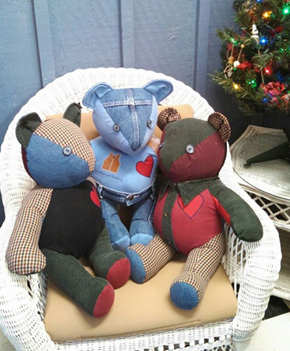 Sarah Breitbarth and Judy Marben, co-owners of Pins and Needles Alterations, have been crafting their special collection of Memory Bears for many years, but the demand for them picked up considerably starting at Christmas 2005. Since then, we have provided families with over 180 huggable, lovable memories to cuddle and cherish. As the years go by, we hope to fill even more homes with precious memories. 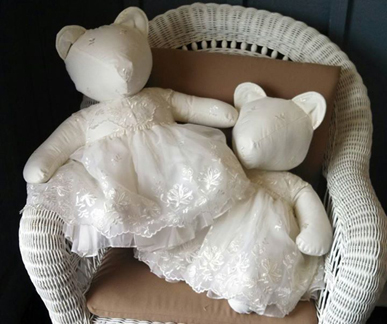 The wonderful part of turning that special garment into a bear is that you can have it out to display or just hold and cuddle it, rather than packing it away in a box or the back of a closet just to run across it every so often. Our most popular bear is approximately 18” from head to seat. It is a “sit down” bear. We also offer a 12” bear if the amount of fabric is not sufficient for a large bear. To make one large bear, the fabric equivalent of an adult long sleeved shirt is required. We are always pleased and surprised at the creativity and ideas of our customers when they order their bears. It usually just takes a few minutes looking at our sample photos to get their own ideas to flow. 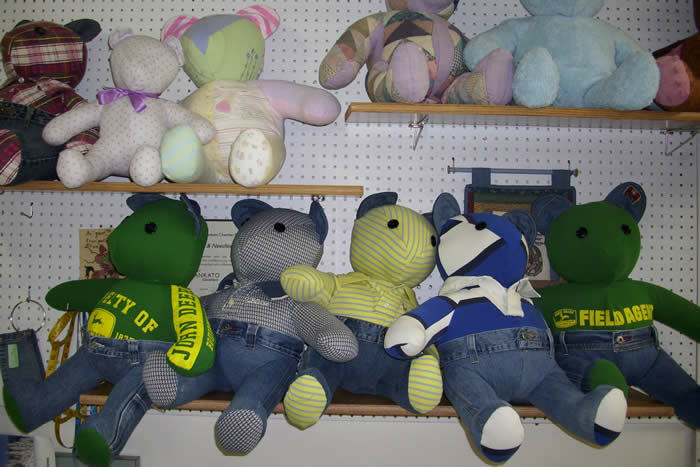 Making Memory Bears is a fun and creative diversion from the normal sewing that takes place every day at Pins and Needles Alterations. We are so happy to have found this meaningful niche to fill in our community and now look forward to making friends all over the world! It always warms out hearts to see the smiles and sometimes the shine of tears in the eyes of the new friends we make when we present them with their new old friends.